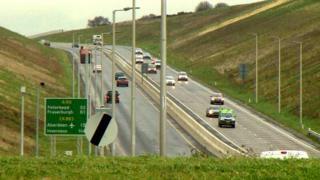 The troubled Aberdeen bypass is expected to fully open on Tuesday morning. The final section of the project, known as the AWPR, will be available before the morning rush-hour "subject to operational planning". The bypass - stretching 36 miles (58 km) - was approved by Scottish ministers in 2009. However, the £745m project fell behind schedule, and is now expected to cost more than £1bn. Talks have been ongoing about liability for extra contractor costs over the original price tag. A Transport Scotland spokesman confirmed the operation to open the bypass will begin on Monday night and the road will be fully accessible before the morning peak time on Tuesday. Problems with the River Don bridge crossing have held up completion of the project. Preparatory work for the AWPR began in August 2014, and construction began in February 2015. The first main bypass section - between Parkhill and Blackdog - opened in June, and the Balmedie to Tipperty section of the bypass fully opened to traffic in August 2018. The Scottish government's transport minister Michael Matheson said: "This new section of the AWPR between Parkhill and Craibstone now allows the full benefits of this transformational project to be fully realised. "Since the major part of the road opened in December 2018, the overwhelmingly positive feedback has demonstrated the positive impact that infrastructure can bring about in people's lives, the quality of their environment and the economy as a whole."